When I reviewed Syl Sylvain and the Teardrops’ album back in April of this year as part of the A to Z project, I thought I just might further explore that iconic group from which he came. Syl’s album, if you recall, made the Ram 20 for its undeniable bounciness and enjoyability. And so when I came across the New York Dolls’ first album in the $4.99 CD section, I scooped it up. I remember in high school borrowing the album from a friend and not wanting to return it. It was the same friend who lent me her copy of Foxy magazine, which was a little odd because she had a pretty conservative appearance herself, and Foxy was like Seventeen for groupies. Me however, reading that one issue of Foxy as a teen and that whole Annie Fannie thing during my pre-teen years (please refer back to the August post on The Electric Kool-Aid Acid Test) were not the most positive influences on my adolescent and post-adolescent life. 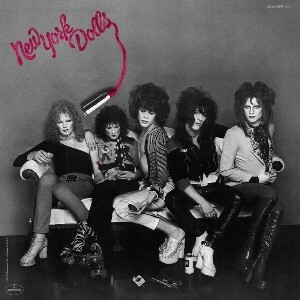 But the New York Dolls were right up my alley. At least this album. The cover was considered shocking back then and I dug it. The cover and the shock value. Now when I look at it I see some discomfort there, except for David Johansen aka Buster Poindexter, who looks quite comfortable, and the easy on the eyes Johnny Thunders who also made an attractive woman, in an early 70s glam/punk sort of way. You know, I once knew all the words to “Looking For A Kiss,” now I can’t understand what the hell Johansen’s saying. A couple of years ago, when I had premium channels, I came across a documentary called New York Doll about Doll bassist Arthur “Killer” Kane. He was then in his mid-fifties, a recovering alcoholic and a Mormon. He worked in the library and seemed like a gentle person who was content with his life. The film however was about the 2004 New York Dolls reunion, and followed Kane around as he prepared, nervously yet excitedly for the event. Guitarist Thunders and drummer Jerry Nolan had both died about a dozen years prior, but David Johansen and Syl Sylvain had signed on. We get to see a bit of the pre-production, in which the remaining Dolls see each other again for the first time in a long time, and have to rehearse together. Kane had been out of the limelight for quite a while by then, but once they got on stage, it was fun to watch and see how thrilled the unassuming Killer Kane was to be there. Then – he goes home. About three weeks later he’s not feeling well, goes to the hospital, is diagnosed with leukemia and dies that day. I was not expecting that. I knew Johhny Thunders had died, but was not up on my Dolls so hadn’t heard about Kane. Sad yet ironic, isn’t it? He had been so happy at the reunion and with the events before and afterward, and relished being able to perform again as a Doll. Lucky actually he didn’t know he was sick because he got that chance. Sylvain and Johansen remain the crux of the Dolls and are still out there performing together. The New York Dolls’ glam/punk New York club scene sound appealed to me then and their debut album still provides some fun music, and makes for a pretty good workout.